When a band like ‘Mumford and Sons’ has sold out the 3 Arena for the same night, an artist like Vance Joy could go unnoticed. However, Vance sang to a crowd of devoted fans during his show on the European leg of his tour Nation of Two in a packed Olympia Theatre on Friday the 16th of November. 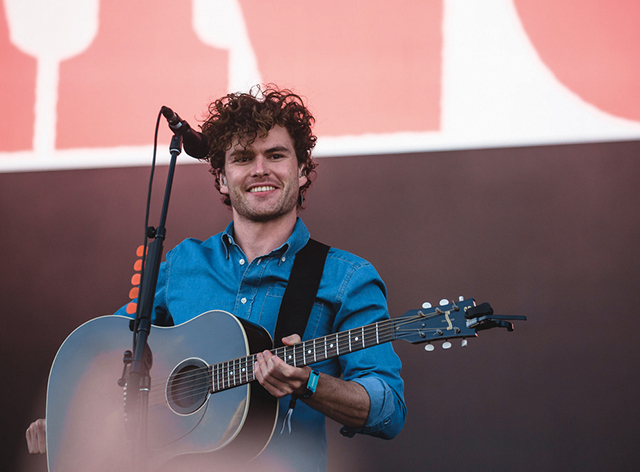 Vance Joy (born James Keogh), the Melbourne native, was introduced to the world back in 2014 with ‘Riptide’, the song which put him on our airwaves. Vance then followed up with anthems such as ‘Mess is Mine‘, ‘Georgia‘ and ‘Fire in the Flood‘ which saw him soar worldwide. ‘Riptide‘ has over 200 million views on YouTube and over 500 million Spotify streams. However, Joy is no one-hit-wonder with ‘Mess is Mine‘, ‘Georgia‘ and ‘Fire in the Flood‘ featuring another 400 million Spotify streams between them. Joy was also handpicked to open for Taylor Swift’s worldwide tour 1989 and also performed at Coachella. Dublin was his final stop of the Nation of Two tour. Two sold-out Dublin gigs in this iconic venue packed with energetic fans is the perfect end to the tour. The opener for this concert was Canadian songwriter Scott Helman who had his break after the release of his full-length album Hôtel de Ville with star singles ‘Ripple Effect’ and ‘Kinda Complicated’ making waves since 2017. Helman brought energy and atmosphere to the Olympia to an initially chatty crowd. The songwriter’s music featured some impressive lyrics and a strong beat to grab the audience’s attention. An impressive performance from an up-and-coming young star. Joy immediately had the crowd in awe after just one song through his meaningful lyrics perfectly placed upon an infectious beat. There is no doubt that Joy is an incredible songwriter who expresses life experiences with thoughtful lyrics without sacrificing the melody. The songwriter balances the emotions of his songs with simple rhythms, all the while pulling it off effortlessly. The pure happiness the singer expressed kept the crowd on a high for the whole set. During his performance Joy and his band decided to mix things up with a remix of Lionel Richie’s ‘All Night Long’ mashed up with Justin Bieber’s ‘Sorry’. The crowd responded with full energy singing every word back. ‘Riptide’ played later in the set and the crowd sang so passionately and loudly that Joy was overwhelmed. The colourful and happy lights, interrupted by Joy’s anecdotes of his life, gave for an honest performance. It became obvious that the singer’s voice was strained from the previous performances when mid-way through a song he had to stop and start again in order to hit the very high octave note . This added to the humble, honest and happy performance. The humble songwriter gave credit to his immensely talented band, which featured brass, multiple times during the concert. It is clear that the performance, portrayed to be effortless, had been very well rehearsed and thought-out. The singer was note-perfect during his whole set. On the day of the concert, Joy released his latest live album Live at the Red Rocks Amphitheatre and it features most of the set-list from the gig. This album gives a good idea of what it’s like to see the singer perform live. There’s little else left to be said for this outstanding performance by Joy and his band but the concert contained everything you would expect: effortless good sound and incredible story telling.